April's Bag of the Month is the Tiffany Bag from Sallie Tomato. 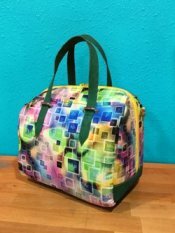 In this two-session class, you'll make this contemporary satchel that's fun to construct and even better, there's no bias binding! 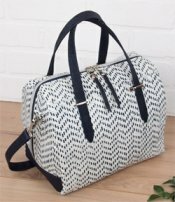 This bag features an adjustable crossbody strap, handles, an exterior slip pocket, wide opening luggage style zipper closure, and is fully lined. This satchel looks great in any fabric combination—you could even use cork! Please see supply list. An email will be sent to you with specific instructions to prepare your materials before class day. Please be sure we have your current email address when you register for class.